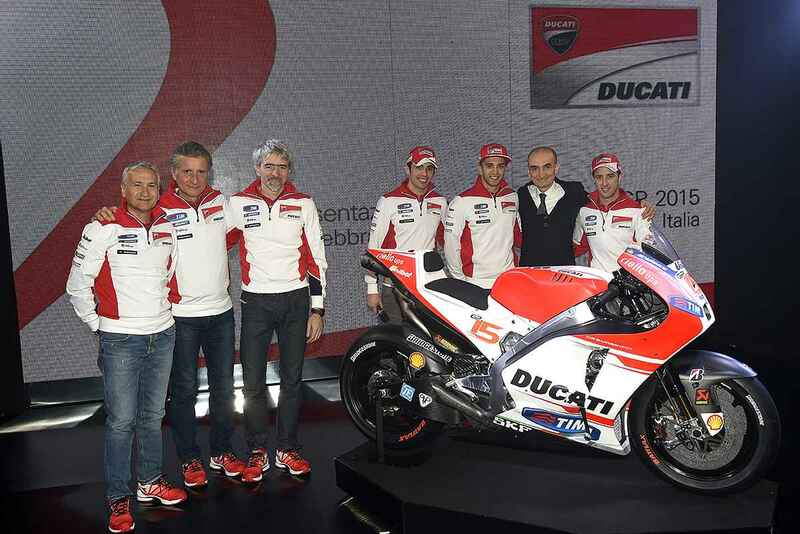 Earlier this week, leading Italian bike maker Ducati’s MotoGP team has finally unveiled Desmosedici GP15 ahead of the forthcoming 2015 MotoGP World Championship season. The latest version of Ducati’s MotoGP machine is all new and carries the expectation of helping to close the gap in competition with Honda and Yamaha. Ducati Team riders Andrea Dovizioso and Andrea Iannone were on hand to unveil the new Ducati Desmosedici GP15 at the Ducati Auditorium in Bologna, Italy. The event was conducted by Guido Meda, Italy’s long-time MotoGP TV commentator and Deputy Director of SKY Sport Italia. The new bike will make its public on track debut in the next test in Malaysia at the Sepang 2 test on 23 February. GP15 is more compact than its predecessor the GP14. New GP15 is designed by Gigi Dall’Igna, who joined the team at the end of 2013, the GP15 Desmosedici gets a completely new twin-spar aluminum frame with a carbon fiber sub-frame. Dall’Igna said, “Our aim this year is very ambitious, because we want to win at least one race. We know that it is an extremely tough objective, but we are used to accepting the most difficult of challenges. Last year we said that we wanted to reduce the gap to the winner to less than ten seconds. This was also an ambitious challenge, but we achieved it in the second half of the championship.” GP15 is powered by liquid cooled V4 four stroke engine. V4 engine is also re-positioned in order to provide more space for front Tyre. When Ducati took a place on a pedestal. Casey Stoner scored the title astride the 800cc Ducati Desmosedici GP7. After that, team learned a lot about new technology and upgraded existing versions for the 2015 season. World famous Plug-in-hybrid BMW i-8 spotted at Indian dealership, launch soon!